They are virtually indestructible. Apart from a little slug damage when the new shoots appear in April, they appear to attract no pests. They are perennial so they come back year after year. You'll get bigger and better tubers if you dig up the remaining artichokes in spring and replant just the biggest ones, but it makes them very economical; buy once, replant infinitely. choose the biggest to replant for next year. You can grow them in the same spot each year. You don't have to integrate them into a rotation plan and prepare a bed for them every year. The tubers can be harvested from autumn throughout the winter into early spring, so a long-lived crop and one that is producing for you at a time of year when little else is growing. The plants are tall and if you choose the position of your Jerusalem artichoke bed with care, they can act as a windbreak for more tender crops. The artichokes are highly versatile in the kitchen. You can roast them under a Sunday joint like potatoes, or roast along with other rot vegetables. They make a delicious gratin Dauphinoise, substituting thinly sliced artichokes for the potatoes. You can make Jerusalem artichoke fritters, you can mash them, you can eat them raw, shaved thinly into salads. They make a beautiful creamy puree that can be used as a base for soups. But they do divide people. I think you either love them or loathe them. And whichever side you're on, you can't deny the one thing that puts many people off Jerusalem artichokes. They make you fart. 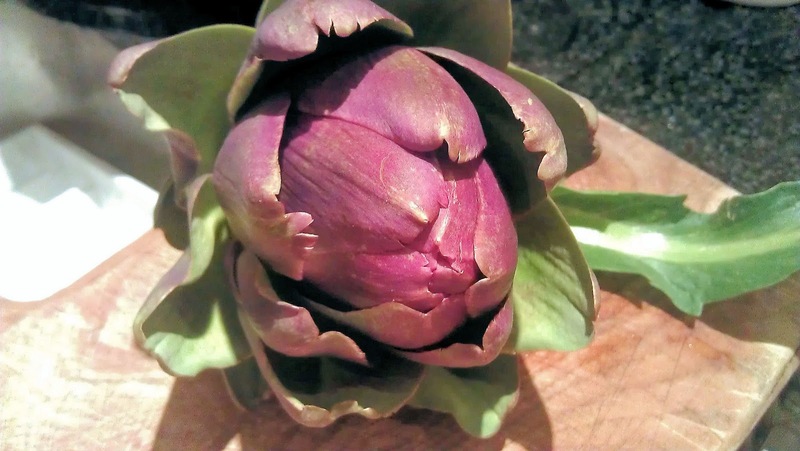 Each tuber, whether raw or cooked (and funnily enough, I think the effects are less explosive after eating raw artichokes) contains a carbohydrate called inulin, which gives you wind. Not for nothing are they usually known as 'fartichokes' in the Zia maison. squeezed into it to stop the bright white flesh from discolouring. 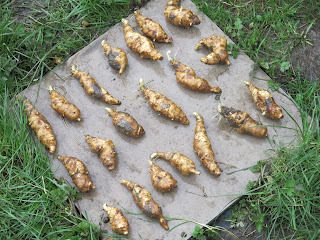 So while I have no inhibitions about serving Jerusalem artichokes to supper guests - after all, they will leave at the end of the evening and do their farting in the comfort of their own home (and so will you) - I would advise not serving them at the starting of a camping weekend, say. Note that the Jerusalem artichokes pictured here are quite distinct from globe artichokes, the giant round buds which we eat, spiky leaf-bud by spiky leaf-bud, until you reach the nutty heart in the centre. Despite the fact that both plants are called artichokes, they are not related. Globe artichokes belong to the same family botanically as thistles; Jerusalem artichokes are related to sunflowers. Quite how they both ended up being commonly called artichokes isn't 100% clear: it's thought that the Jerusalem artichoke is a corruption of girasole, the Italian word for sunflower. Unrelated botanically to either Jerusalem or globe artichokes, the Chinese artichoke, or Stachys affinis, looks like a smaller, skinnier, paler version of a Jerusalem artichoke tuber. Actually, I think they look like fat cartoon caterpillars, but don't let that put you off. Like Jerusalem artichokes, the tubers can be planted in spring. 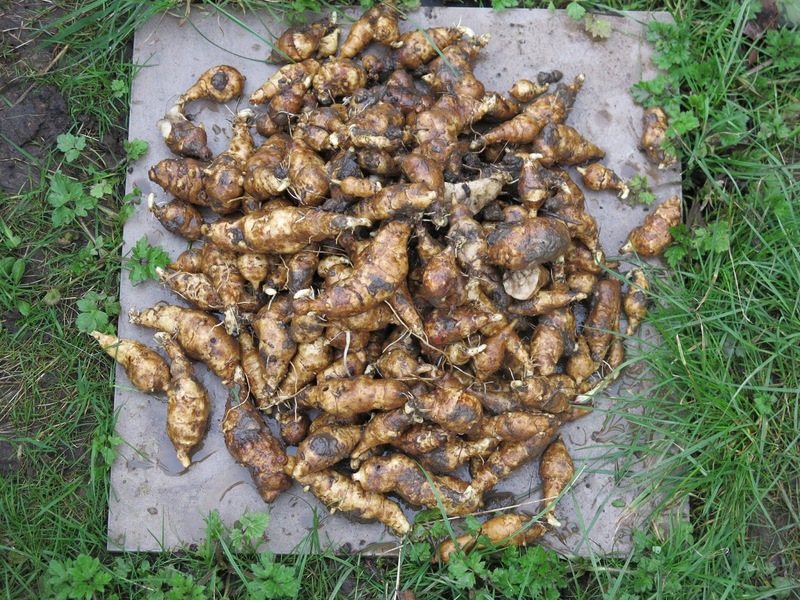 They are then harvested from late summer onwards, and again, keep some healthy tubers aside at the end of the season for replanting for the next year's crop. The taste of these is not dissimilar to Jerusalem artichoke and they can be cooked the same way or in stir-fries, or served raw like a salad vegetable. Have a large bowl of cold water mixed with a little lemon juice standing by you. 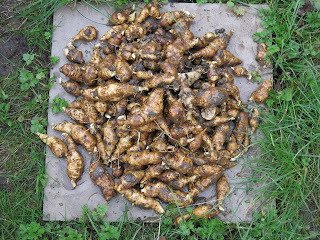 Scrub the Jerusalem artichokes and peel them, putting each artichoke in the bowl of water once peeled to stop them from going brown. Then slice the artichokes into rounds as finely as possible. Arrange the slices neatly and evenly in layers in a shallow gratin dish. After each layer, season with a little salt and pepper and a smear of butter. Once you’ve placed the final layer of artichoke slices, sprinkle with the chopped parsley, then pour over the cream. Top with a knob of butter and a last pinch of salt and pepper. Cover the dish with foil and bake in the oven for 20 mins. Remove the foil and put back the in oven uncovered for another 10-15 mins to brown the top. Drizzle over a little walnut oil when you serve. 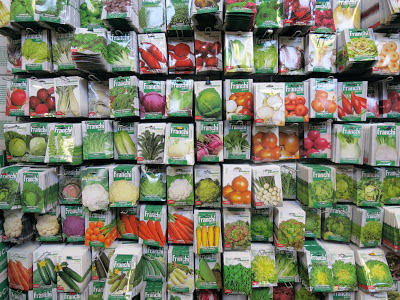 over 500 different seed varieties in total. 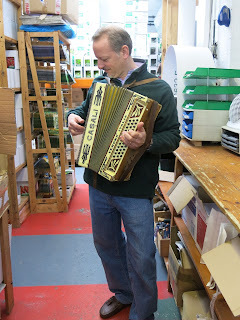 Seeds of Italy held an open day at the weekend at premises in Harrow. It was a chance to see, under one roof, the full range of seeds from Franchi Sementi, which Seeds of Italy distributes in the UK, plus its ancillary products - preserving jars, soaps, packet seasonings and tomato presses. It was indeed the horticultural equivalent of being a kid in a sweetshop. With a friendly welcome and coffee and biscuits it was also a chance to chat about growing produce in the UK with the immensely knowledgeable and infinitely enthusiastic Paolo Arrigo, head of Seeds Of Italy and author of From Seed To Plate, which is one of my favourite cookbooks. Paolo was keen to talk about provenance on Saturday - how the parent company, which has been run by the Franchi family since 1783, carefully sources its seeds, how the Italians treat the locality of its produce with the utmost seriousness, how the produce specific to each region is used together. Much of the seed sold in the UK these days, Paolo says, is bought in from China, with little attention paid to its suitability for our climate. In contrast, looking at - for example - the courgette varieties offered by Franchi, I can see Zucchino Bolognese (from Bologna), Zucchino Genovese (from Genoa), Zucchino Fiorentino (from Florence) and Zucchino Nero di Milano (the black courgette of Milan!). You don't get different British counties extolling the provenance of their parsnips, although a few regional varieties live on in the names - Kelvedon Wonder peas, for instance. Interestingly, as Paolo points out, we're better at protecting the local heritage of our fruit: think of all the different apple varieties and where they come from. And compared to China, Italy is much closer to the UK in terms of growing conditions, Paolo explains. We may think of Italy as mainly Mediterranean, and hot, but 74% of the country is mountainous and the southern tip and Sicily aside, it gets very cold in winter. I can believe it. I've always bought as much of my seed from Seeds Of Italy as possible, because 1) the quantities of seed in each packet is always generous, 2) the varieties offered are always interesting and frequently different to those on sale in the shops here. Lots of different - and very local - courgettes and squashes, for instance, from the deliciously sweet and nutty Berrettina Piacentina pumpkins to the round stuffing courgette Tondo di Nizza. It was also Seeds of Italy that introduced me to the pink and white striped beetroot from Chioggia, which I know is now available more widely but which was quite surprise find 10 years ago. 3) I always get good results from Franchi Seeds: near 100% germination and healthy plants. Lastly, and definitely not least, is this idea of provenance, of knowing where the seed is from and where it has been saved. The blurb that comes with Seeds Of Italy packets online is always knowledgeable and specific (in contrast, amusingly, to the sowing instructions, which are decidedly cryptic!). 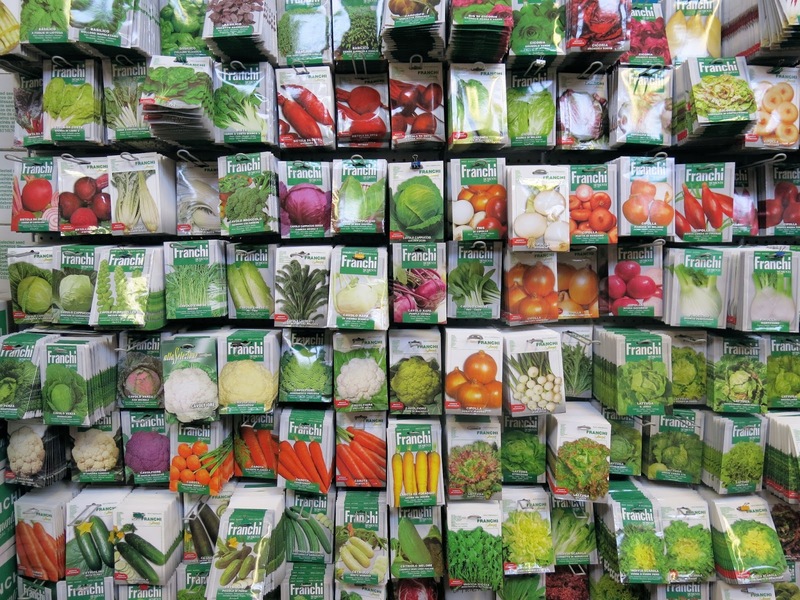 After a delicious couple of hours browsing, I left happy, clutching a number of seed packets, including some Puntarelle - that crunchy Roman salad leaf, a variety of chicory, which I now discover originally hails from Catalonia rather than Italy, even though it's now so strongly associated with Rome. I'll plant this along with the other chicories I grow, the round radicchio and elongated red Rossa di Treviso, and look forward to winter salads next year. is around 80 years old and sounds as good as new.